How to Survive If You Get Lost in the Woods & Come Back Home Safe? ​Don't get shocked knowing that. Every year, thousands of people get lost or go missing in the woods all over the country. The rangers at the New York State Department of Environmental Conservation do search and rescue missions for 200 people a year. Too many people go into the woods with no plan, and underestimate how confusing and disorienting dense woodland can be. What Is It Really Like to Be Lost In The Woods? 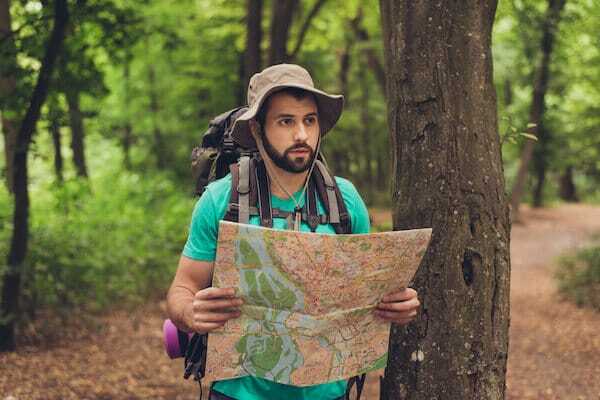 How to Avoid Getting Lost in the Woods? If you've never been lost in a national park or woods before, then you might snigger at the thought of someone losing their way. It's easy to think "how silly do you need to be to get lost?" but the truth is that it happens to everyone, even people with a good sense of direction. How many times have you, honestly, taken a wrong turn in a familiar city? Woodland is different to built-up areas. We are all blessed with a good internal compass. The problem with woodland is that it is dense, it all looks quite similar to those who aren't familiar with it, and there aren't many obvious landmarks to allow us to orient ourselves. That's why national parks have clearly signposted trails, and why we're supposed to stay near to them. That's why it's so important that when you're going off the beaten path you have a compass, and you identify clear landmarks (a peak, a river, or something similar) that you can use to keep yourself on the right track. Perhaps you headed off the pathways to pitch a tent, and then you've woken up and panicked, because "everything looked so different when it was getting dark". You thought you knew where you were going, and you walked for a while only to realize you were wrong. Now you have no idea where you are. Being lost can be scary. At first, you might panic, then calm down a little and think "how bad can it be"? If it's daylight, warm and dry then you might think it's going to be a fun adventure. Don't take your situation lightly, though. The Oregon Office of Emergency Management conducts more than 1,000 search and rescue missions each year. The good news is that 89 percent of the people they go looking for are found alive. Sadly, eight percent die and the remaining two percent are never found. Being lost is serious. If you're lost by yourself it's easy to freak out, and it's important that you take control of your internal narrative and start being realistic about what is happening and how likely you are to be found. Read on to learn about the most important steps to take and the issues that you need to solve. If you're lost in a group, then there can be the risk of taking the situation less seriously, especially if some of the people in the group aren't well versed in wilderness survival and don't understand how serious the situation is. It can be easy for the loudest voice in the group to take over and say "I watched Man Vs Wild by Bear Grylls, I know what to do". Don't follow the loudest voice, if the loudest voice has no real credentials. What time of year is it, and what is the weather likely to be like? Do you have water with you, and if so, how much? Have you dressed appropriately for the time of year? Who knows where you are, and when are they expecting to hear from you? Will your absence be noticed quickly? In the best case scenario, you are dressed well for the weather, not likely to fall ill from thirst any time soon, and your absence will be noticed within a few hours. In the worst case scenario, you're on a long holiday, lost in unfamiliar territory with no supplies. Either way, if you've been able to assess your situation then you will be in a better position to decide what to do next. 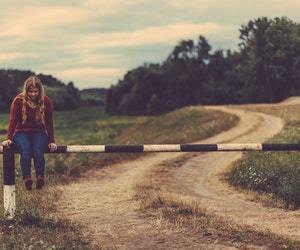 When you realize you're lost, the single most important thing that you should do is STOP. You have determined that you don't know where you are. There is no point in moving in a random direction. The further you go, the more lost you will get. The chances of moving in the right direction if you keep traveling are minuscule. You will probably just make it harder for rescuers to find you. If you are in a dangerous place right now, move until you can find somewhere safe to sit down, and then stop. Think, think & think! Don't Fret. Take several deep breaths to clear your head. If you have some supplies on you, eat a little bit to bring your blood sugar back up, and drink a small amount of water. When you can think clearly, try to figure out where you are. Can you remember what direction you were heading? Can you see any landmarks that make it easier for you to tell where to go next? If you notice something that jogs your memory and you are sure that you are correct, then start moving in that direction. If you're not certain, then don't move. Again, if you keep moving you are making it harder for rescuers to track you down. If you have a compass and a map you should use them to try to re-orient yourself. If you don't have them, or you aren't confident in your ability to really read them (which could be why you got lost in the first place), then spend some more time looking for landmarks. Is there a river nearby that you could follow to try to get back to civilization? Take a moment to think about your situation. Do you have any idea what time it is? Do you have long before it starts getting dark? What is the weather like? If you are with other people, how are they feeling? Are they able to move or do they need rest? Your next steps will depend on the needs of the other people in your party, and how confident you are that you will be able to get back to a marked trail. If you think that you have an idea of where the trail is, then you can try to get back to it. However, you should move carefully, and mark your train in some way. Break branches and stick them in the ground at regular intervals, or rip up an old garment from your pack and leave strips tied to branches. Again. Do not move unless you are extremely confident that you are going the right way. Your priorities will differ depending on whether you are stuck alone or with a group, and the age of the group, as well as their health. If the weather is cold and wet, you will need to find shelter. If you don't have water, you'll need to find a source of clean, safe water. If someone in your group has a medical condition, then this could make getting rescued vital. Pool resources if necessary to support that person. If someone is injured, then basic triage and first aid is a must. Stop any bleeding, use a makeshift splint to support injured limbs. If you have decided that you are definitely lost and that you're going to wait to get rescued, then the first thing you need to do is exactly that. Wait. If it feels like this point is being excessively emphasized, that's because it is so important. In 2013, two teenagers, Nicolas Cendoya and Kyndall Jack, went missing. Only one of them was found - because the two young hikers when lost, decided to keep moving. They believed that they could find their way out. Instead of waiting, they lost faith that rescuers would come, and made their situation worse. 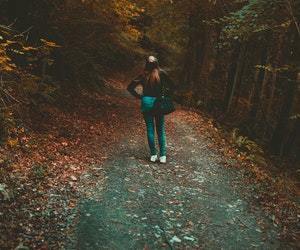 Most people who go missing in the woods are found dead within just a mile of their last known location because they got so disoriented that they were literally walking in circles. As hard as it is to do, you need to have faith and wait for rescue. You will need to 'hunker down' and stay safe. That means staying warm and dry and protecting yourself from any animals that might want to bug you at night. You will also need to stay hydrated. If it's raining, leave out any containers that you have to try to catch some raindrops. You could even use leaves to make a 'funnel' to catch the liquid and let it run off into a bottle if that's all you have on you. Rainwater is a handy source and relatively safe to drink. Water from lakes and streams is also useful, but even if it looks clean there's a chance that it's full of bacteria. You should boil water from those sources before drinking it. If you do not have any way of doing this, then you're going to have some difficult decisions to make. It's better to fall ill and be treated with antibiotics in hospital after rescue than it is to die because you didn't have anything to drink. Making sure you stay hydrated should be your main priority. You will need some shelter to protect you from the elements. It's also useful to build a fire to keep you warm and to scare off some animals. If you're going to light a fire, clear a large space to do it in. The last thing you want is for some sparks from the fire to cause a true 'forest fire' - yes, that will attract attention, but you could also get trapped in the fire yourself because forest fires don't just move in a straight line. The wind picks up embers, and you can end up with fires burning all around you. If you want to attract attention, build three fires in a triangular shape. That is an internationally recognized distress signal. If it's been raining and your clothing has got wet, then you want to take it off and dry it off. You want to try and regulate your body temperature. Stay dry, and warm (but not too hot). Even if the weather is quite mild and it's nice out during the day it could get very cold at night. That's why a shelter is so important. A cave shelter is the most convenient option since it is ready-made. 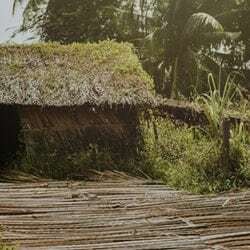 A lean-to shelter is another low-skill and low effort option. Lean a large branch against a tree, and place smaller branches at a 45-degree angle along the large branch. Cover the structure with foliage, to create a shelter that should protect you from rain, and be warm and cozy. Try to cover the ground with something so that insects can't get in your clothes while you sleep. You are going to start getting tired. When you're tired, you start making bad decisions. Get as much rest as you need, but make sure that you complete the key survival tasks. A shelter, a sleeping area as comfortable as you can make it, and a fire with enough fuel to keep it going are musts. If you have some food with you, ration it. Do not try to find berries or nuts to eat unless you really know what you are doing. There are lots of plants out in the woods that look deceptively familiar but are actually poisonous. You can go several days without food, and if people know that you are missing rescuers will be out there looking for you. Bears are the biggest threat. Grizzly bears will leave you alone if you don't disturb them. Stay away from a mother bear and any cubs. 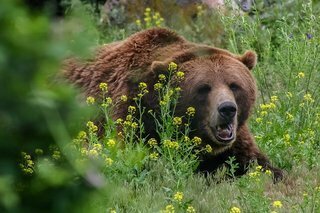 If a grizzly bear looks like it's going to attack, play dead and stay still until you are completely sure that the bear is gone. Tips to keep bears away from you. Black bears will avoid you if you don't get too close. If you see one, walk away, talking loudly so that the bear knows you are there. If a black bear attacks then it is worth fighting back using whatever tools are at your disposal. Beware, take every steps carefully! If you wait for several days and don't get rescued, then you may want to try the desperate measure of finding a stream and following it to civilization. Do not do this unless you are certain that help is not on the way. In the ideal world, you would never get lost in the first place. If you're planning a trip to some woodland, then you should give your itinerary to your friends and family, and agree to check in at regular intervals. That way, if you do get lost, you will know that your absence will be noticed and that help will be on its way. Pack a map and a compass, even if you don't think you're going to be heading off-road. Practice using them before the trip. You might have learned how to use a compass in the Scouts, but be honest - when was the last time you tried? Make sure you know what you're doing before you head off. Practice lighting a fire using sticks, too, or buy a tinder striker so that you can make a fire more easily. If you're going to pack matches, put them in a ziplock plastic bag because otherwise they will inevitably get wet and become useless. When you're out hiking, try not to leave marked pathways. If you do decide to go 'up a hill to take an awesome photo', mark your route so you can find your way back down. Always try to stay within sight of your party, and keep checking your map to make sure that you really do know where you are. Be honest about your fitness level and the level of others in the group, and don't be shy about asking for help if you're struggling and see others on the trail. The woodlands in the US are amazing places, and they can be a lot of fun to hike through, but nature is out to get us sometimes, and we should always treat it with the utmost respect.